Combine your golfing getaway with prolific game viewing in South Africa's wilderness areas. South Africa is world-renowned for being both a world-class safari destination as well as being home to a proliferation of championship golf courses in incredible settings. The country is thus the ideal choice for combining a wild sojourn with a topnotch golfing experience. Here is our list of the top five safari golf courses. Skukuza Golf Course, built within the belly of Kruger National Park, was originally established by the camp’s personnel for recreational purposes. The 9-hole 18-tee course may not be the number one course in the country and bears no lofty accolades, but its unfenced location in this world-renowned reserve sets it apart. Nowhere in the country can the game be enjoyed in such untamed proximity to the African wilderness. Uninvited spectators frequent the greens and fairways and, as such, players should be extremely cautious. Many innocuous antelope, warthog, zebra and giraffe utilize the Skukuza Golf Course for alternative drinking holes and grazing, but hippo and baboons have also been known to wander across the grounds and guests should keep their distance. Though rare, reports of big cats taking down kills on the course are not unheard of. Every game offers its own unique adventure. Skukuza is located in one of the most wildlife-rich regions of the Kruger National Park. This retreat lures many visitors, both four-legged and two-legged. Though by far not the most illustrious of South Africa’s golf courses, Skukuza has the unique advantage of running its greens across one of the most renowned wilderness areas in the world. The Kruger Park Lodge Golf Course offers a leisurely Gary Player-designed 9 holes in the heart of the Lowveld. The African wilderness begins at the edge of the kikuyu-coated fairways, while dazzling azaleas and bougainvillea crown the Bayview greens. Crocodiles and hippos colonize the waterholes. Warthog and impala roam the grounds and make wonderfully opinion-free spectators. The surrounding vegetation consists of traditional Lowveld acacias and shrubbery, complementing the wild setting. Though not exceptionally difficult, the par-36 parklands course still offers gratifying play with wide bunkers and water hazards. Guests play within close proximity to the world-renowned Kruger National Park – the ideal opportunity to enhance a South African golf tour with an unforgettable Kruger Park safari experience. In an area abounding with unique recreational activities, from lion and cheetah encounters to river rafting, the Kruger Park Lodge golf course offers the complete holiday experience. The property overlooks the prolific Sabie River that runs all the way to the Kruger Park and rushes on through Mozambique. Facilities on the resort include four tennis courts, three swimming pools, a restaurant and various children’s playground activities. There is also a driving range at the entrance gate. Various walkways network around the golf course and along the river, and guests may observe the resident hippo from the safety of a hippo hide built on the edges of one of the many dams on the property. Though two separate courses, the Gary Player and Lost City Golf Courses are located within the same wild milieu. The Gary Player Golf Course lies nestled in the distinguished grounds of the Sun City Resort and ranks as one of the most acclaimed green arenas in the country. Designed by its namesake and home to the annual Nedbank Golf Challenge, the course will delight golf enthusiasts from every corner of the world. Kikuyu fairways and bent-grass greens cut through the wild bushveld to combine the best of both worlds; a gentleman’s game in untamed Africa. The Parklands-style Gary Player golf course was never intended for amateurs and often claims the label of “toughest course in the Southern Hemisphere”. When construction of the resort began in 1978, the decision was taken to build a golf course that would rival the best in the world – a status that the course retains to this day. Stamina, accuracy and patience are key. Against the backdrop of the illustrious Palace of the Lost City and the encroaching wilderness of Pilanesberg, a round on this course will prove unforgettable and lure players back for more. In addition to the Gary Player and Lost City golf courses, the resort boasts a remarkable plethora of activities and facilities, from the exhilarating waterpark with its state-of-the-art wave pool and super slides to evening shows and casino glamour. The Lost City Golf Course in the Sun City Resort offers a Gary Player-designed course with a distinctive desert style. Rolling over 6947m with fallow bunkers and multiple tees, Lost City boasts a unique water hazard with some rather exotic residents; a few dozen Nile crocodiles. In this dramatic bushveld location, the green golfing oasis could not provide a more thrilling experience for its players. The clubhouse is a short walk from the resort’s finest hotel – the Palace of the Lost City. Designed with the Zimbabwe ruins in mind, the building complements that mythical African architecture typical of Sun City. The Crocodile Restaurant – named for the course’s scaly inhabitants, naturally – offers light meals and snacks in between rounds. The Lost City Golf Course offers gratifying playability for most levels of golfers. However, the African adventure does not end at the edge of the fairway. For visitors wishing to enhance their holiday experience, the Sun City Resort offers an elaborate waterpark with a large wave pool, two casinos, live shows, spa facilities as well as safari excursions to the nearby Big Five-bearing Pilanesberg Game Reserve. Leopard Creek is our choice option for a golfing safari in South Africa. This exclusive course rests its bent grass greens and kikuyu fairways on the doorstep of wild Africa, separated from the world-renowned Kruger National Park wilderness reserve by the gurgling Crocodile River. Leopard Creek is popular among passionate golfers and nature lovers alike, with frequent sightings of buffalo, hippo, crocodile and an assortment of antelope from points of play. Fortunate guests may even sight elephants sating their thirst in the river below. 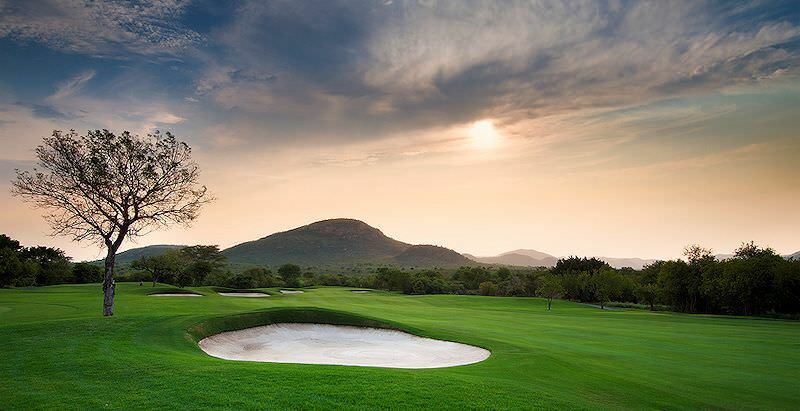 Designed by Gary Player and Johann Rupert, the parklands-style Leopard Creek Golf Course boasts a world-class feel in the midst of untamed grasslands and thorny acacias. Extensive water features and bunkers serve to challenge every level of golfer. The 505 meter par-five 13th is truly spectacular, as the green rests on the edge of the Crocodile River 32 meters above water level – essentially a breathtaking window into the park. Visitors are urged to enhance their golf experience with a safari in the Kruger Park – only a bridge drive across the river. Kruger is the finest location in the world to enjoy a golfing safari, blending the world-class greens of the course next door with the untouched magic of the South African bushveld. This incredible wild corner of South Africa is truly what safari dreams are made of, and complementing it with an exclusive golfing experience at Leopard Creek will make it the getaway of a lifetime.